GLOBAL STAR: Young Achiever award winner Bindi Irwin. SUNSHINE Coast tourism operators have scooped a swathe of awards at this year's annual Queensland Tourism Awards. Individuals and businesses celebrated at Friday night's ceremony in Brisbane as they took out the third-highest number of award wins, with 11 accolades. The Sunshine Coast region was awarded five gold, three silver and one bronze awards with two Hall of Fame inductees. The Sunshine Coast's five gold winners include "Australia's Nature Coast" campaign (Sunshine Coast Destination Limited in partnership with Fraser Coast Opportunities), Noosa Boathouse, RACV Noosa Resort, Bindi Irwin for the Young Achiever's Award and Australia Zoo for the Major Tourist Attractions category. 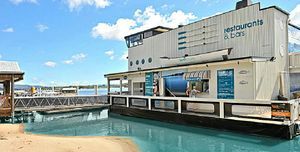 Queensland Tourism Awards were also presented to Hall of Fame inductees Noosa Boathouse (Tourism Restaurants and Catering Services) and RACV Noosa Resort (Deluxe Accommodation); having won gold in their selected categories for three consecutive years. A total of 81 awards including 27 gold, 25 silver, 22 bronze and two individual awards across 30 categories were presented at Brisbane's Convention and Exhibition Centre on Friday night where 900 guests gathered to celebrate Queensland's tourism achievements. The event was hosted by the Queensland Tourism Industry Council and presented by Queensland Airports Limited in partnership with Tourism and Events Queensland. QTIC chief executive Daniel Gschwind congratulated Sunshine Coast's winners and said the awards provided the opportunity to pay homage to the hard-working, dedicated individuals and organisations who have helped shape and transform the industry. "Since 1985, the Queensland Tourism Awards have highlighted the important role tourism plays in driving Queensland's economic and community development and recognise the businesses and individuals who continuously raise the standard of their tourism services and experiences," he said. More details are available at http://www.queenslandtourismawards.com.au.